Kimberly Bennefield’s “Triangle Art” quiltYou wouldn’t guess it from looking at her masterfully detailed quilts, but Kimberly Bennefield has only been quilting for three years. 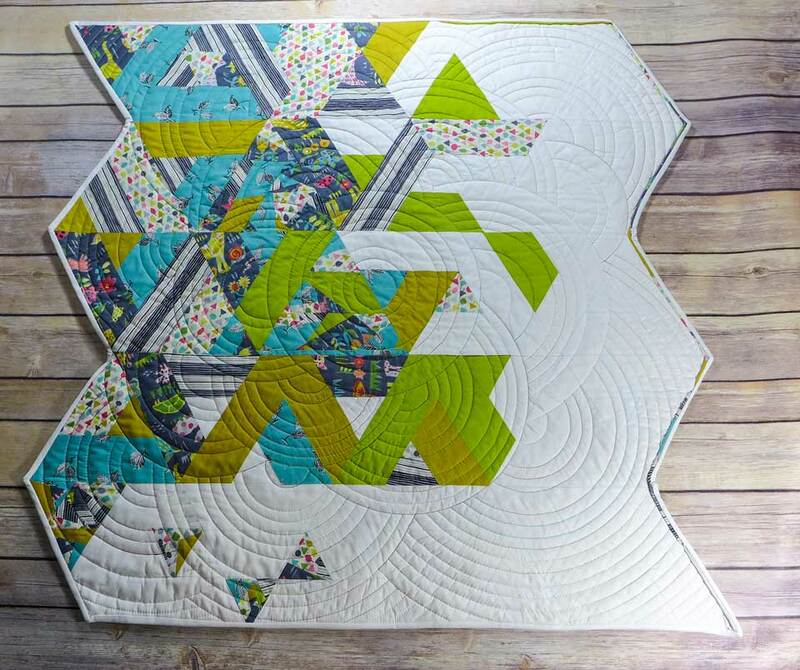 As the current president of the Portland Modern Quilt Guild – the largest in the nation with 341 members – Bennefield has taken the art of modern quilting to new levels, with skillfully pieced patchworks and bold color combinations. “Over time, the fabrics have changed so much, with more vibrant colors,” said Bennefield, adding that the popularity of Pinterest has introduced quilters to a new era of innovative patterns and ideas. Modern quilting has been gaining traction since the late 1990s. Whereas traditional quilting tends to rely on repetitions, orderly rows, and symmetry in both the patchwork and the quilting, the modern approach is more free form with unusual arrangements and experimental fabrics. “I’m really good with tools and finding a different approach,” she said of picking up the technique so fast. “She showed up at our guild meeting a little over a year ago, showing us her first quilt,” said Joy Ruplinger of the Portland Modern Quilt Guild. “We almost fell out of our chairs looking at her piece, one that only a seasoned quilter would attempt. It’s fair to say that Bennefield has an innate knack for creative design. In her personal life, she tried her hand at Bob Ross-inspired landscape painting and sewed clothing and Halloween costumes for her four children when they were younger. With her kids now grown up and moved out, Bennefield has found the time to focus on quilting. She taught herself the basics through online tutorial sites like Craftsy and Creative Bug. Essentially, the sandwich is compiled of three layers: the top design made from piecing together various fabrics, a middle layer of batting, and a bottom layer (or backing) which is typically a solid piece of fabric or another less complicated design. For her quilts, Bennefield usually follows patterns from online sites like Pinterest and Instagram, but says her next step is to create her own. She’s also drawn to bright colors, pixelated effects, and playing with negative space. Her quilting technique often employs spiral stitching, too, starting in the center of the blanket and working outwards. In 1998, Bennefield moved from her native Houston, Texas to Beaverton, Oregon to take a job at Nike, where she was also the president of the Black Employee Network for five years. Later, she jumped ship to Intel, where she’s currently employed as a user experience designer. As a quilter, it’s a perfect fit. Bennefield works from her home, which means she can do double duty between her work station and her quilt station, which are strategically located in the same room in her house. Beside a professional desktop set-up, Bennefield’s quilting world opens up into a colorful array of fabric swatches, ironing boards, sewing machines and measuring tools. The surrounding walls are lined with shelves of spooled and rolled fabrics, neatly organized by color and pattern. “Most of my work meetings are these online deals, so I will literally break out the iron when things get stressful,” she said. She’ll often alternate from one quilt to another, too, and laughingly pointed to a box of scraps or half-started projects, which she calls her UFOs (“unfinished objects”). 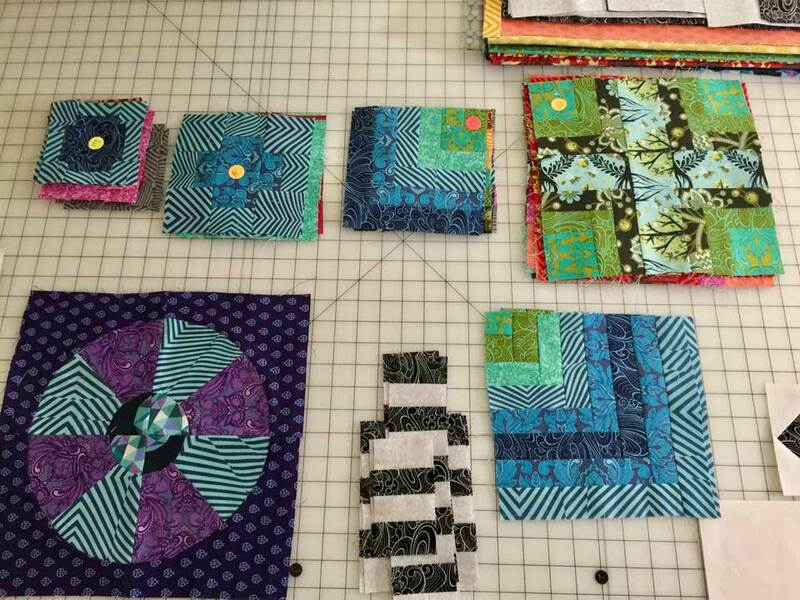 Last year, Bennefield joined the Portland Modern Quilt Guild, which meets monthly at St. Andrew Church on Northeast Alberta Street and also hosts a number of workshops with guest quilters. Recently, the guild welcomed famed pattern designer Alison Glass. It took little time for Bennefield to became guild president, a one-year rotating volunteer position. Her biggest goal as president is to grow to 400 members, while still making sure everyone is accommodated. “Our guild members are instructors that teach across the world… Portland is a diversely creative city,” she said, adding that the guild is also made up of people of all ages and genders. As for her own quilting projects, Bennefield has also branched out into quilted handbags, some of which she’s sold.